Most of us look forward to treating ourselves at the local barbershop, hair salon, or beauty spa. After just a few snips, brand new nail polish, or a relaxing massage, we emerge feeling refreshed. We go to barbershops and salons to look good for memorable events in our lives, a special night out, or just for some monthly pampering. As relaxing as a barbershop, salon, or spa may be, there are hazards present. Sharp instruments, electrical appliances, chemicals, and the high usage of water can create dangerous conditions for customers. To add to this, the level of experience of the stylists working in a barbershop or salon can also contribute to injury. While many injuries may be relatively minor, some accidents can result in severe injuries. Scars, burns, or disfigurement can cause lifelong pain and suffering. 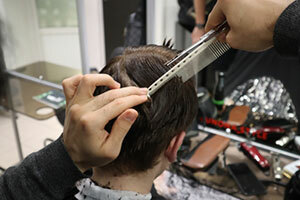 If you have been injured while visiting a barbershop or salon, call the Wolfson Law Firm for help. Our Barbershop accident lawyers defend the rights of injury victims. Call 305-285-1115 for a free consultation. Cuts and lacerations – Scissors or razors used to give us that great cut can also hurt us. We can be poked, jabbed, or scraped by sharp objects. While these may seem like minor injuries that will clear up, they can lead to serious infections if not treated. Cuts and scrapes received during a pedicure can easily become infected if that basin that you put your feet in wasn’t properly washed and disinfected after the last customer was served. Burns – Products used to style our hair may contain chemicals, which can cause burns or allergic reactions. In some cases, these burns can cause permanent scarring. Reactions to chemicals used in hair can result in temporary or permanent hair loss. If hair dryers, curlers, or straighteners are used, these can cause burns to our neck, head, or face. Slips and falls - Sprays that hairdressers use as they style your hair can land on the floor, making it slippery when you get out of the chair. Water spilling out from basins used to wash hair can result in slippery floors. Pedicures can be particularly dangerous. Stepping down from an elevated position onto a wet floor can cause serious injury if you slip and fall. How can a Barbershop Accident Injury Lawyer Help You? The Wolfson Law Firm represents victims who have been injured while visiting a barbershop, salon, or spa. Those injured may incur high medical bills or lose wages if they can’t work. You may have a personal injury claim which would entitle you to compensation for medical treatment and lost income. If your injury resulted in permanent scarring or disfigurement, you may be entitled to compensation for pain or suffering. Hair loss or scarring on the face can cause lifelong anguish. If you are unsure if you have a case or if you have questions, we can help. Contact the Wolfson Law firm at 305-285-1115 for a free and confidential review of your case.